Taichung Ching Chuan Kang Airport has been officially rechristened as Taichung International Airport, as part of a broad drive to remake the airport into a passenger and freight hub for Southeast Asia. 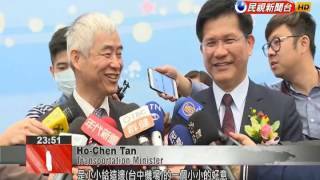 Transportation Minister Ho-Chen Tan took advantage of today’s renaming ceremony to announce that landing fees at the airport will be reduced by 20 percent to attract more flights. At special ceremony highlighting extensive upgrades to Taichung International Airport, Transportation Minister Ho-Chen Tan revealed news that he hoped would stimulate growth at the airport. Landing fees have been reduced by 20 percent, which should provide a small benefit to (Taichung International Airport) in its hope to attract more flights to and from Southeast Asia. Passenger volume at Taichung International Airport has increased rapidly, from an average of 1.28 million passengers to 2.3 million passengers a year. The number of flights through the airport has also risen accordingly, from 58 to 85 per day. After becoming Taichung International Airport, we’re hoping to attract 6 million passengers per year. Our plan is to become an international airport in central Taiwan and accommodate even more passengers and freight. Transportation Minister Ho-Chen Tan and Taichung Mayor Lin Chia-lung presided over today’s ceremony commemorating the airport’s continued drive toward international expansion.